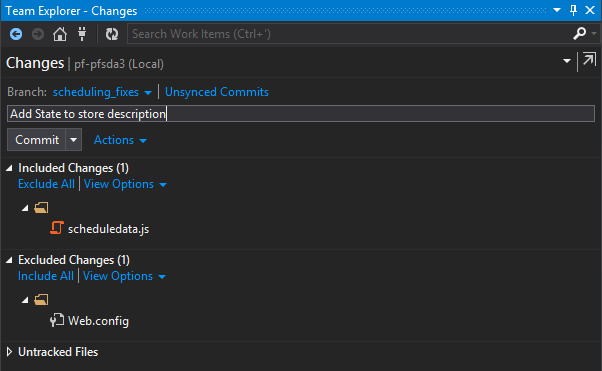 In this post I’ll outline how to make code changes when using Git with Visual Studio. This applies regardless of where git is hosted (TFS, GitHub or elsewhere). Note that in some cases, origin/master will NOT be our upstream repository. For example, we might be working off a Development branch. So make adjustments as appropriate when following this guide. I’m going to assume that you’re already set up with your repository, either through TFS or by using the method outlined in my blog. Let’s say you’re ready to develop. Click on New Branch and set the name. 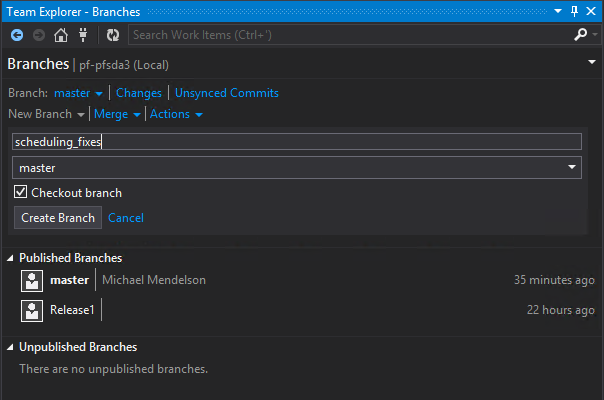 You’ll see your new branch under “Unpublished Branches”. 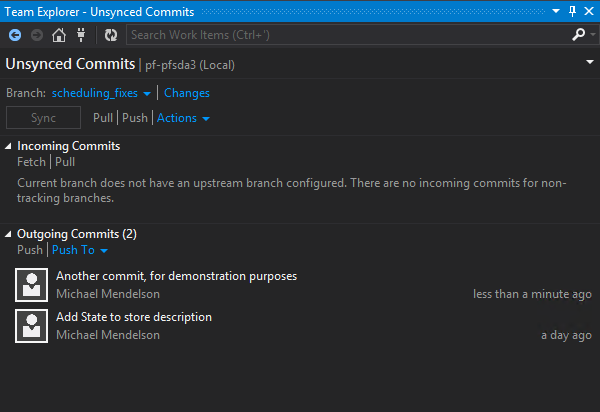 In TFS, “unpublished” means that the branch exists only locally. Note that the value of the branch dropdown has been changed. You are now working on the new branch that you’ve created. Go to the Changes view. Your changed items will be listed. Add a comment for your commit (required). Click Commit. Changes are committed locally. In the Merge tab, click on the Merge dropdown. Set it up to merge the changes to your local master. Since this is your LOCAL master, you’re unlikely to have conflicts. Notice that you’ve been automatically switched to the master branch. You’re done with your old branch, and it can be deleted if appropriate. 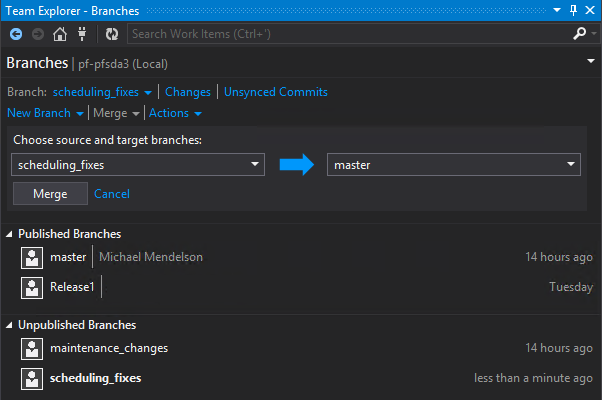 Click Pull to merge all changes locally. Address any conflicts between our check-ins and the merged ones. Retest the code as necessary. Note: The Sync button will both pull and push in a single step. The problem with this approach is that you don’t have the opportunity to test any merged changes! If your local repository is in sync with the upstream server, you can simply push without the pull. But to avoid an error, simply pull first.